On Friday 11 May, Suffolk Community Foundation welcomed HRH The Earl of Wessex to the new Headquarters of Birkett’s Solicitors in Ipswich. In addition to officially opening the new HQ, he also met representatives of six Suffolk charities who support young people in Suffolk, and some of those they have helped. 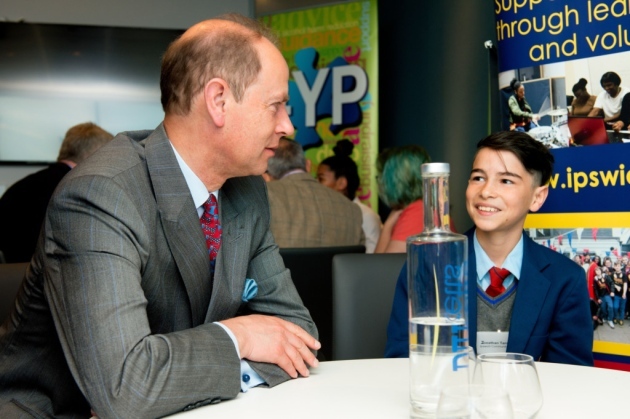 At the event, HRH The Earl of Wessex met representatives from the public sector, business people, private philanthropists and many experts who are passionate about supporting young people to blossom and become the very best that they can be. Youth volunteering in Suffolk is struggling to rise above half the national average, compounded by particularly poor levels of aspiration. The Earl of Wessex has a special interest in young people and, as well as Founder of the Wessex Youth Trust, since 2015 has been Chairman of the Trustees of the Duke of Edinburgh’s International Award Foundation. This visit to Suffolk provided an opportunity for the Earl of Wessex to learn about the work of 4YP, Ipswich Community Media, the Porch Project, Inspire Suffolk, the Bangladeshi Support Centre and Access Community Trust. During the Event, he was introduced to the Grants Team at Suffolk Community Foundation as well as members of staff from Birketts who have a successful charity fund, which is administered, in Suffolk, by the Foundation.